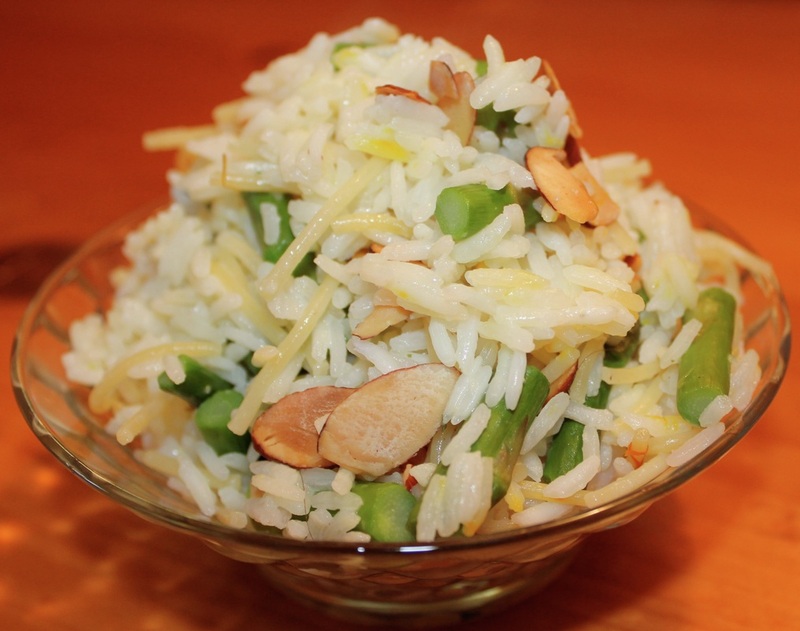 This Asparagus Rice with Almonds recipe uses roasted asparagus, toasted almonds, and a pinch of saffron to add a nice depth of flavor. For best results, you should try to time it so the rice, almonds and asparagus are all done cooking at the same time. Coat asparagus with 1 teaspoon of olive oil. Place asparagus on a baking sheet and roast for 10 minutes. Set aside. Place slivered almonds on a baking dish and toast at 400 degrees for 5 minutes. Set aside. Heat a medium size saucepan, add 1/2 tablespoon olive oil. When oil is hot, add garlic and saute until tender. Add the rice to the oil and toast for about 1 minute. Add the broken spaghetti pieces and toast another 1-2 minutes. Add a pinch of saffron and pour the chicken broth into the sauce pan, bring to a boil, reduce heat, cover, and simmer for 15-20 minutes. When the rice is done add the asparagus and almonds.